For a certain IoT design I had to understand how my box design impacts the temperature of the circuit and of my battery. To understand how it works in the real environment, I made a small circuit based on an Arduino Nano to get temperature with 6 different sensors and store it in a flash memory for later use. This post describes the way to do this multi-temperature sensor platform. Code is under GPL. 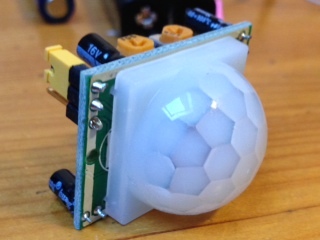 This is a PIR ( Infra Red ) sensor ; this device is detecting movement of people by sending a signal on its output. This sensor is generating a +3.3V signal on output when a movement is detected. The duration and the sensitivity can be parametrized. As you can see on this photo, you have 3 things you can configure on this device that will impact its behavior. The purpose of this post is to describe the use of each. Some new hacking on Raspberry PI, the objective is to get a TC74A5 3.3VAT temperature sensor working with a RPI. This sensor is a digital sensor type 2 wires I2C operating at 3.3V with a precision of 2°C. Here is a quick hack to interface a temperature sensor to a BeagleBone Black unit. I choose to use a Microship TCN75AVOA component. This SMS component is not really easy to use for prototyping but feasible. This component have a unit cost < 1€ and operate at 5V or 3.3V (as for BeagleBone). A Dip8 version exists. The communication with the CPU is numerical based on a two wire connection type I2C. It measures from -40°C to +125°C on 8b + 4b decimal with +/- 1°C precision.